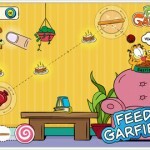 Feed Garfield is a cute physics-based game app for kids and adults. Kids have to find ways to deliver food into the lazy cat’s bowl directly, and collect the 3 lasagna on the way. 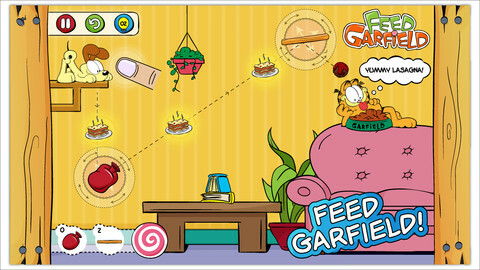 Kids learn strategic planning and simple physics while having fun with Garfield and Odie. There are 45 fun and mind-boggling stages in the app. The app works on iPhone, iPod, and iPAD. It was $0.99. It is FREE for limited time. Odie has to use his hunting skills to sniff out the food. Once he finds the food source, he must shoot the food straight to Garfield’s bowl. It’s a tough challenge for the dopey dog, but he knows he has to feed the kitty! He needs to make sure the food will go straight into Garfield’s bowl. But wait, there’s more! Help Odie drop the food and get all the lasagna along the way. There are 3 pieces of lasagna strategically placed in every stage. Work your way through the game and collect hidden objects along the way to get special-edition Garfield wallpapers and unlock bonus levels! If you get stuck in the game, use Hints to get clues on how to solve that particular stage. But you must remember, use your Hints wisely. You will only be given a few. You can always get more hints inside the shop. Who doesn’t love Garfield?! I’ll have to download it for my boys and myself. Hi– the link doesn’t seem to work!